Christopher Tamayo as Dickon and Noelle Fries as Mary Lennox. "I'm the dead lady," jokes Andrea Olsen. The Spokane-area actress and recent star of Always, Patsy Cline at Spokane Valley Summer Theatre is describing her role as Lily Craven in the company's new production of The Secret Garden, a 1991 musical based on Frances Hodgson Burnett's 1911 novel of the same name. Despite operating from beyond the grave, Lily is actually a key figure in the story. She's both aunt to young Mary Lennox and wife of widower Archibald Craven, whose lives intersect when Mary is orphaned during a cholera epidemic and transported from her home in India to Archibald's manor house in Yorkshire, England. There Archibald is still grieving over the loss of his wife, and Mary, through the discovery of an all-but-forgotten garden, inadvertently finds solace in things that were also dear to the late aunt she never met. The two of them, each survivors in their own way, begin to find ways to move past their pain. "She basically is what brings healing to his life, and to everybody that's there. The son that Lily and Archibald Craven had together, Colin, was born premature because she fell off a tree in her garden. My husband's brother is a doctor, and he's taking care of the boy, but whether he realizes it or not, he's malnourishing the boy. He keeps him inside and keeps him in bed, telling him that he's crippled, that he's sick," says Olsen. Mary ends up befriending Colin and shows him that he's capable of far more than anyone thought. "It's Mary finding where her purpose in life is. It's Mary bringing Colin, her uncle, and everybody at the manor back to life." One of the reasons that Burnett's tale for children has had such enduring, cross-generational appeal is the garden of its title. It can be taken purely at face value, as though it were just a beautiful and mysterious backdrop, but can also function as a source of poetic meaning. "The garden really embodies rebirth and growth," she says. "The garden represents Lily and what she loved — making things grow, making things beautiful — and for Colin, the garden represents his mother. Some of the food they bring to Colin to eat to get well comes from the garden. So the garden represents the wife, the mother and the restoration of everything." In this production, Archibald is played by Michael Muzatko, Colin by Olsen's real-life son George Dawson, and Mary by Noelle Fries. 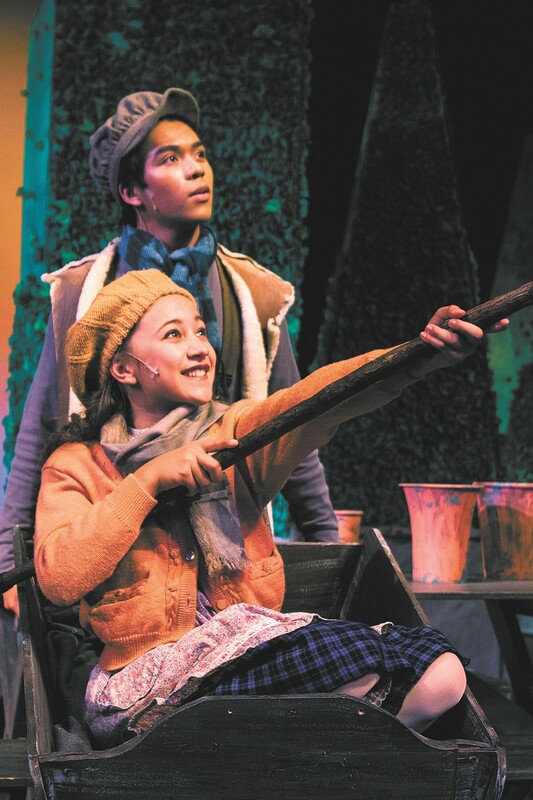 Though not yet a teenager, Fries has already appeared in several popular local productions, including Les Misérables at the Spokane Civic Theatre — where, incidentally, she played Olsen's daughter. "Noelle is a force. She's a fantastic little actress," says Olsen. "She probably is the more professional of all of us onstage. She's a delight to work with, and she is Mary." Unlike its source material, the stage version of The Secret Garden is suffused with music. Olsen describes it as "very operatic" in nature on account of its recurring themes, its eclecticism and its chorus of ghosts. "The chorus is what moves the story along. They are the people in India who are dying. They are the dreamers, or the ghosts, if you will, that are haunting the manor. They are the spirits in unrest," she says, and that "tumult" is captured in several dramatic storms that take place throughout. "They are these intricately woven and layered pieces of music, with themes that you recognize, and yet the chorus is singing these driving rhythms." As a result of its music, its ambitious set design and its "sheer emotion," Olsen says that The Secret Garden will have a lot to offer audiences of all ages.